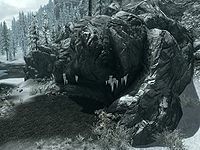 Steepfall Burrow is a small cave containing animals on the north coast of Haafingar. There is a second exit to the cave named Lower Steepfall Burrow with its own map marker (which therefore counts as a second location for the "Locations Discovered" statistic). However, this exit cannot be used to access the upper part of the burrow. When entering there is a ledge on your right with a snowberry bush and a second bush in front of you. The tunnel heads south before turning to the east and opening out into a cavern with a bridge across a deep drop into water. There is a frost troll on the other side of the bridge. Behind which is a tunnel rising to the east, leading into a cave with another frost troll, and beyond that is a skeleton laid out with a copy of the Destruction skill book Mystery of Talara, v3 and a random sword, potion, shield and helmet beside it, while in the corner opposite is a boss-leveled, unlocked chest with a large coin purse, a random weapon in front and a snowberry bush at either end of it. The drop from the bridge into the water is survivable and leads to Lower Steepfall Burrow. At the bottom of the pool is an apprentice-level chest with a random soul gem lying next to it on the southwest side. There is also a small coin purse and random warhammer near some mammoth ribs on the north side. Directly under the bridge, on the west side of the pool, is a short, underwater tunnel leading to a cave, where there is a small pack of ice wolves living, one of the wolves is standing right next to where you emerge from the tunnel. South of where you surface is an unlocked chest, which is to the left of an earthen ramp leading up to the ledge above. On the ledge there is a corundum ore vein with a snowberry bush to the right and to the left is a dead hunter, with a random dagger on their left and a satchel on their right. Just north of where you surface is a small tunnel leading to an entrance/exit at the bottom of the mountain near the shore. This page was last modified on 19 May 2018, at 18:24.